Manchester United reportedly remain interested in a potential transfer swoop for Leicester City defender Harry Maguire. However, they would face paying as much as £90million to prise him away from the King Power Stadium this summer, according to the Daily Star. Much as Maguire is a fine player, this is surely too much money to pay for someone yet to really perform at the highest level. Despite being 26 years of age, the England international has never played in the Champions League, and has only 17 caps to his name despite shining in last summer’s World Cup. 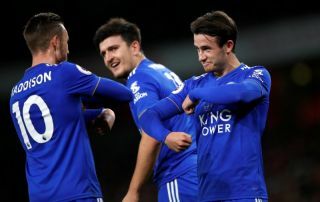 Given that Virgil van Dijk moved for less (yes he came from Southampton but played – and shone – in the Champions League with Celtic), and players like Kalidou Koulibaly and Matthijs de Ligt would probably cost a similar amount, that surely means Maguire is off the table for that kind of price. The former Hull City man was linked with us last summer and looked expensive at £75m, as referenced by the Star, so any more than that just seems ridiculous.